Portstewart Golf Club was founded way back in 1894, but the origins of golf being played here date back even further to 1889. The Strand course is a bit of a hybrid, a mix of the old and the new. Major development took place in the late 1980s when the original Willie Park layout was updated and seven new holes were constructed in the virgin sand dune range called “Thistly Hollow”. The new Strand course, designed by Des Giffin, opened for play in 1992. And what an exhilarating golf course this is, set amidst imposing, gigantic sand dunes with panoramic views across the Atlantic mouth of Lough Foyle to the Inishowen peninsula beyond. The Strand is an incredibly challenging and thoroughly enjoyable golf course, with one of the best opening nine holes in golf. The 1st hole is an absolute stunner, one of golf’s most intimidating, a downhill 425-yard par four. There is a plethora of great holes here at Portstewart Golf Club; especially memorable are two of the new par threes, the 3rd and the 6th. The 3rd is a challenging single shotter, measuring 207 yards, whilst the 6th, measuring a mere 140 yards with a plateau green, is also a tough cookie and will stay in the mind for a long time. James W Finegan on the course: “How good is the Strand course at Portstewart? For my money, just one rung below County Down and Portrush and under no circumstances to be missed.” From Where Golf is Great – the finest courses of Scotland and Ireland. Credit must go to the designer because the new holes blend seamlessly with the old holes. Sometimes, when new land is taken in, there is a punctuation between the old and the new. Not so at the Strand. Portstewart is a lovely course, in a lovely setting with lovely holes. Having read reviews I was fully expecting the excitement of the front nine and the lesser back nine, but like I felt at Hindhead I actually thoroughly enjoyed both nines. Unfortunately playing in the March the 2nd and 3rd were closed, which was a shame as the 2nd looked a cracker. There are too many holes to mention and playing with 40mph gusts made it very hard. I am just going to note a few of holes that I enjoyed. 4 is all about placing the ball in the right place. Don’t try for 2 unless your are on it. 5 is lovely, place the tee shot and then go for the green. 8 is a great hole, take a bit of the hill and get your ball down to the lowest level. On the back 9 just enjoy it is a run of really good holes I personally really liked 11 and 16. The round for us was not about scoring but just trying to keep the ball in play and maybe make a few pars. I would love to play again in the summer with less wind and be on my game. I can guarantee one thing, bring your game and you will walk off with a massive smile on your face. Portstewart sometimes gets a bad rap for having just nine good holes (the front nine) along with an inferior back-nine. Now, this is true to a certain extent but I’d like to clarify and put it into context by saying that the front nine is rivetingly magnificent and the inward half still exceptionally good. The tee-shot on the first is one of the most enjoyable in golf for sure. On a fine day you will see a line of cars parked along The Strand – a near two-mile stretch of sandy beach – and steep dunes to the right which were a shooting location for a scene from Game of Thrones. If you are a dune-junkie you will be in golfing heaven on the front-nine. Each hole either plays through, round or over the dunes and the green locations are superb. The fairways, often of which you are only granted a slither from the tee, are equally undulating and tie in nicely with everything else. The front-side at Portstewart is quirk on a big scale and something absolutely special. Each hole is completely unique and Giffin, a local schoolteacher, was probably in the wrong profession at the time because the routing and design is superb. The back-nine makes a somewhat inauspicious start with a green complex at the 10th which is rather uninspiring but the course quickly recovers and whilst we have mostly left the towering sandhills behind us, and now play on relatively flatter ground close to the River Bann, the terrain is still good for golf and there are some wonderful holes over sweetly undulating ground. The round quickly recovers at the excellent 11th and although the short 12th and the subsequent back-to-back par-fives are not the greatest they are solid holes, especially the latter. What is not in doubt are the finishing four holes and the test they provide. The 15th is a bigger version of the irresistible 6th whilst the final three holes all top the 400-yard mark and with the daunting pulpit green at the 17th make for a championship finish; one that Jon Rahm eased through on his way to victory in the 2017 Irish Open. From the tee Portstewart is challenging but infinitely playable and certainly not unfair. Into the greens it is a highly demanding course. You only have to be a little bit off with your iron play to suffer some serious consequences. It can at times be a cruel master. The course overall doesn’t cut the same mustard as neighbouring Portrush or Royal County Down, a couple of hours away at Newcastle, but it is a comfortable third (ahead of Castlerock) in Northern Ireland and at times does match the exceedingly high quality of the top two. Forget Machrihanish (I say that tongue in cheek), this golf course has the most dramatic and panoramic first tee shot in golf. My eyes were wide open staring around me from that elevated platform. The front nine is carved out of the largest dunes I’ve seen. Each hole is a spectacular experience throughout an amphitheater of sand. The dunes frame the holes beautifully and consistently dare you to hit heroic shots. The second hole plays from an elevated tee, to a multi-tier fairway and back up to an elevated green perched among the dunes. I thought it was glorious, and really fun to execute such demanding shots. The course tumbles and winds its way up and over massive ridges, around and over turbulent dune structures, and essentially turns you around 8 times before you get half way. I must give a shout out to the par 4 8th hole. A 220-yard tee shot downhill is all that is required to position your ball on a large platform before you make a 90 degree left turn to face a fabulous downhill approach shot into a well-protected green. The dunes around you are that of a Hollywood movie set. The back nine is another story all together, and it naturally falls victim when compared to the front side. When you get to the 7th green, you get a glimpse of the back nine, which I initially thought was the River course given how completely flat and different it looked. Comparisons aside, I had multiple issues with the actual holes themselves. There are two par 5s back to back that essentially play in the same direction and are roughly the same length. Additionally, the routing of the closing stretch feels really awkward. The 16th hole is a strong hole that brings you back to the clubhouse. Then the 17th plays back away from the house, and the 18th turns around and brings you back. They are three parallel holes sharing the same plot of land, which visually feels really dull and anticlimactic. I’d almost rearrange the order of the last 3 holes so that you’d finish where the 16th green is now. Either way, the back nine on the Strand course is visually and architecturally disappointing – and really hurts the overall perception given how world class the opening half is. As previous reviews have said, the front 9 here is simply stunning; carved out through some huge dunes, it is a fantastic test of golf but also great on the eye. The 2nd being the best example of both. The back 9 presents a different but equally pleasing challenge. The course meanders down the the river and offers some lovely holes, with the 11th and new look 14th both very strong. 17 and 18 make a good finish and require two good hits to make the green. Definitely worth a visit and likely to get even more attention after July this year. Portstewart is a sporty links which should be included on an itinerary to the North Coast. As most reviewers have already said, the front 9 are thrilling. Many of these holes are truly memorable, from the 1st, where you hit down, down into a dogleg right with beautiful views from the tee of the beach and the links below you. 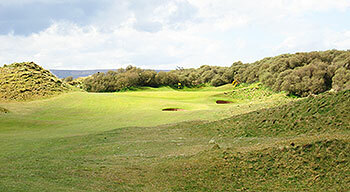 The second is reminiscent of Enniscrone, with a huge dune all along the left and an ever-slimmer fairway to the right. It contines like this for 10 holes or so until you get out to the flatter riverside holes, which are still proper links, just a slightly different character than the front. There are some pushed up greens which add to the difficulty on a couple of the par 3's and the 17th where the approach to the green is truly intimidating. Portrush may be the 'better' course, but Portstewart is a whole lot of fun, just don't expect bulldoze-flat fairways and accept the odd random bounce. The kind of place you'd be happy to play again and again as I imagine no two rounds around here would be the same. The front 9 is fabulous with hole after hole exhibiting wonderful duneland. The first hole sets the tone and holes 2, 4, 5, 6 & 8 standout. The back 9 is not so “wow” but contains many decent holes. The 13th and 14th are the weaker holes (as they have a more inland feel) but the course finishes well from 16 in. A very enjoyable course with some memorable holes. We played Portstewart in Spring after Portrush, and two holes in the duney front nine were out of commission, so naturally it would suffer by comparison. However, it was clearly a top quality course with some notable par 4's. Lovely day, friendly members and some great holes. Memory is suffering at this remove due to time and tour ale by this point, but a really enjoyable game of golf and would love to return when fully open. Played the Strand 10 days ago on a beautiful Sunday morning after a Saturday afternoon round at Portrush. Obviously Portrush is universally loved and scheduled to hold an open soon, but I wonder whether the the ratings would be much closer if the Strand had a "Royal". I absolutely loved Portstewart, and yes, the first 12 or so holes in the dunes are very dramatic (plans to add two more I am told), but the balance of the holes are strong as well. I would say the only place it suffers compared to Portrush was the transition to the greens which at Portrush is very natural. Both greens had recently been thatched so cannot adequately compare, but was told Portstewart generally has more true greens. My view, actually preferred Portstewart. Members were great too. I can’t believe it’s just over nine years since I last played here. The biggest change in that time is undoubtedly the construction of an enormous new clubhouse, which is one of the swankiest golfing premises I’ve ever set foot in – there can be no doubt that Portstewart now has facilities befitting one of the Top 100 courses in Great Britain & Ireland. Everybody mentions the excellence of the front nine and rightly so as it’s a sensational collection of golf holes. The par threes at 3 and 6 are especially good, along with the strongest hole on the card, the 449-yard 5th, where the fairway narrows considerably as it approaches a demanding two-tiered green. The 4th tee box in the dunes behind the 3rd green has also just been upgraded (large swathes of invasive buckthorn bushes have been removed, painstakingly replaced with hand sown marram grass) so it's good to see the club continue to develop the landscape around this fantastic stretch of holes. The inward half, played around the periphery of the dune system, is bound to suffer in comparison to what’s gone before because the fairways unfortunately occupy less spectacular terrain. Nonetheless, there’s plenty to keep you engaged as you head for home. In particular, the 11th is a terrific par four, with an elevated green that’s fronted by a severe dip in front of the putting surface and this terrific hole is then followed by the short par three 12th, which plunges sharply downhill to a green that’s protected by a nest of pot bunkers on the right hand side. The round concludes with three demanding par fours (index 6, 2 and 8) that are routed across the tumbling high ground next to the clubhouse so the golfing challenge at Portstewart is sustained right to the very end. It’s easy to see why the Strand layout remains one of the mainstay venues in the elite North & West Coast Links of Ireland portfolio and it's not to be missed from any golfing itinerary when visiting Northern Ireland. Portstewart tiene hoyos espectaculares, dunas muy grandes hacen que el lugar sea único. No se puede dejar de jugar este campo, si se viaja a Irlanda del Norte. Excelente campo de golf. Roughly translated... Portstewart has spectacular holes, very large dunes make the place unique. 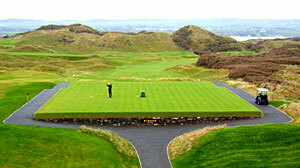 You should play this course if you travel to Northern Ireland. Excellent golf course.